Gunmen dressed as mariachi musicians opened fire in Mexico City’s famed Plaza Garibaldi, killing five people and wounding eight others including a foreigner, law enforcement officials said on Saturday. 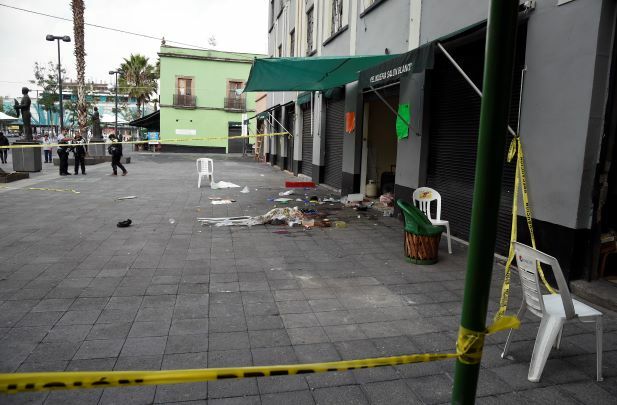 The five assailants opened fire with rifles and handguns shortly before 10:00 pm Friday (0300 GMT Saturday) as the downtown plaza was filled with partiers enjoying the September 16 Independence Day weekend celebrations. Investigators later found 60 empty bullet casings on the ground. “There are five people who have died in the Plaza Garibaldi incident. Three men died at the scene and two women while in hospital,” a prosecutors’ statement said, further revising a death toll initially given as three, and then four. The shooters fled aboard three motorcycles, the Mexico City prosecutor’s office said. Music and partying continued until after the city’s chief of public security, Raymundo Collins, showed up at the crime scene, video footage broadcast on TV showed. Collins described the attack as a targeted hit. No details were released on the identity of the foreign victim. Investigators have not given a motive for the shooting, but did say that two of the slain men, ages 36 and 46, had been previously convicted for robbery. The shooting eventually emptied the plaza — one of Mexico City’s most popular attractions — and the restaurants and bars in the nearby streets. Police patrol vehicles on Saturday were parked outside venues usually bursting with customers seeking to pay mariachi musicians to perform. Until recently Mexico’s capital had been safe from the organized crime-related violence wracking other parts of the country. Most targeted reprisals have taken place on the city outskirts or in areas where criminal gangs operate. Plaza Garibaldi is located near the notorious Tepito neighborhood, where a local gang that distributes drugs in the sprawling capital of 21 million is based. Police have linked that gang to larger cartels such as the Jalisco New Generation. Mexico has been hit by a wave of violence since deploying the army to fight the country’s powerful drug cartels in 2006. Since then, more than 200,000 people have been murdered, including a record 28,702 last year. Another 37,000 people are reported as missing.